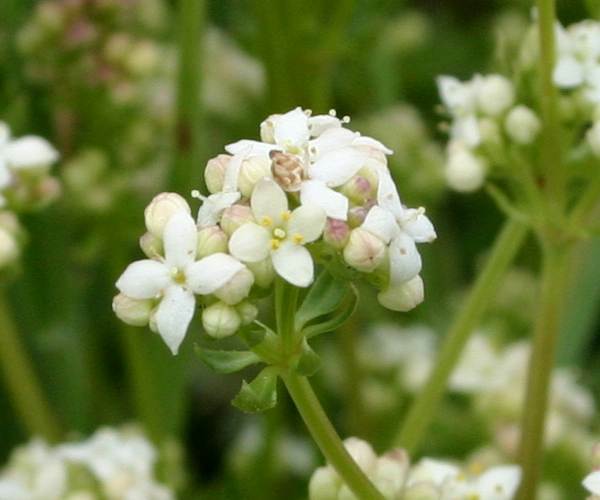 A scrambling perennial of well drained grassy banks, hedge bedstraw blooms from June until September. It is widespread throughout the UK except in the far north and in Ireland where it is not found at all. The plant shown here was photographed in mid June near Teifi Pools, the source of the River Teifi, in West Wales. Cleavers (Galium aparine), commonly referred to as goose grass, is another member of the bedstraw family.